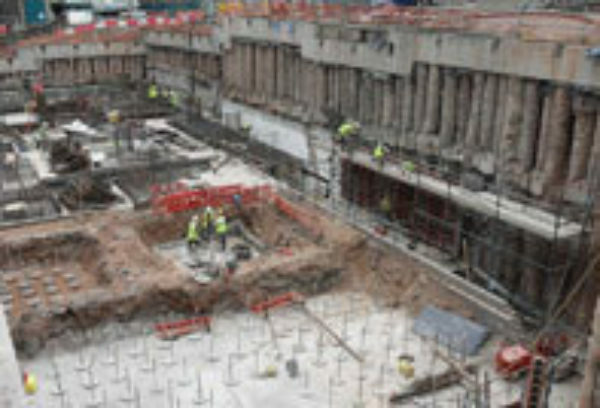 FK Lowry Piling completed the design and installation of the retention system and bearing piles for the £100million 13-storey Critical Care building at the Royal Victoria Hospital (Phase 2B). The building, which includes a two storey basement, is being constructed on a brown field site adjacent to the existing accident and emergency department and outpatient facilities so all steps were taken to minimise disruption and monitor environmental impact. Basement excavation was 13.5 metres deep, with up to 11.5 metres of sandstone excavated with two Dolerite Dykes protruding through the site. FK Lowry Piling was awarded an additional phase to install the retaining walls and bearing piles for the WACH tunnel, to join this building to the proposed Women’s and Children’s Hospital (WACH).